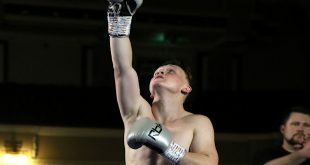 Last night at the Civic Hall in Wolverhampton, England, First Team Promotions main men PJ Rowson and Errol Johnson staged a fight night which was headlined by Rob Hunt of Stafford, who faced experienced Jason Nesbitt of Birmingham in an eight round welterweight contest. Not the tidiest of fights - with Hunt getting a point deducted for holding and which he continues to do throughout the contest. There's a scrap at the end of round six as both men slug it out in the corner just as the bell sounds to end the frame. 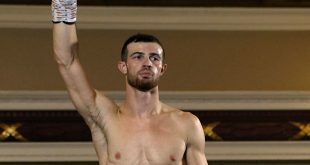 But, Hunt's long-reaching right punch and right hooks to body gave him the points win he wanted and ensure him a title shot early next year. Hunt's record now stands at 11-0 (1). During the intermission, Promoter Rowson was delighted to introduce the 'Bare Knuckle Boxing Champion of the World', Paddy Monaghan, who took applause from the West Midlands crowd. Mr. Monaghan was in the area to promote his book 'Fighting Man', which will be reported on SaddoBoxing later. Popular Bully had a tough contest against the veteran "Gypsy Boy". A good start for experienced Smith, who looked to be enjoying the fight and afforded himself a bit of verbal taunting at his opponent, but Ball's tidy performance and long-reaching right shots secured him the points decision 60-54 after six rounds. Ball improves to 3-0. Arnie, also known as 'Deano' put up a good performance against workhorse Buckley. Wearing the black and gold of Wolverhampton Wanderers, this was only his second time out professionally, but Arnold was impressive against the very experienced Birmingham man, landing a couple of notable straight lefts. Arnold wins on points 40-36 after four frames, giving him his second professional win. These two endured a real scrap of a fight. Both told to keep it clean as they gambol over in the corner, but Seawright is caught with a solid punch in round three and McCauley gets the points decision 40-36 after four. McCauley improves to 2-1. Peter "Desperate" Dunn seems to be pretty well-travelled these days as he was out again last night - this time facing "Scottie Boy" Evans. Sporting his trademark blonde Mohawk haircut - Evans landed lefts and rights to the face of Dunn to secure a 40-36 points win in this four rounder. Evans improves to 6-0 (2). Dunn suffers his 100th loss thus far, but I dare say he'll be back again - somewhere - next week! 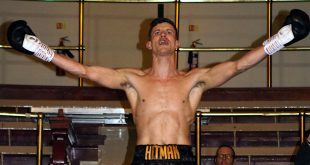 Popular Rooster Colley gained his fourth consecutive win when he faced Yorkshire man Williams last night. Despite what looked like a thumb in the eye during round two, which sees the Rooster flinch, he looked the stronger man against his southpaw opponent. Colley wins by points 40-36 after four and improves to 4-0. 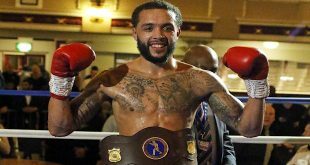 Next Rendall Munroe has been voted Midlands Boxer of the Year.